Use your Onebox® account while on the go with the Onebox app: •	Manage call forwarding settings so you don't miss important calls •	Read or listen to voicemail transcriptions/messages •	Send and receive text messages from your Onebox business phone number •	Choose which Caller ID number is shown when you make or receive calls •	View, send, and receive your faxes right from the app •	Add frequently called numbers to your speed dial list The Onebox service turns your iPhone into a complete business phone system. Don't have your Onebox account yet? Sign up today at www.onebox.com. Onebox is a state-of-the-art office phone system that’s perfect for small businesses, with all the capabilities you could ask for. Your calls are answered with a professionally recorded custom greeting and can be directed to any employee, in any location around the world. 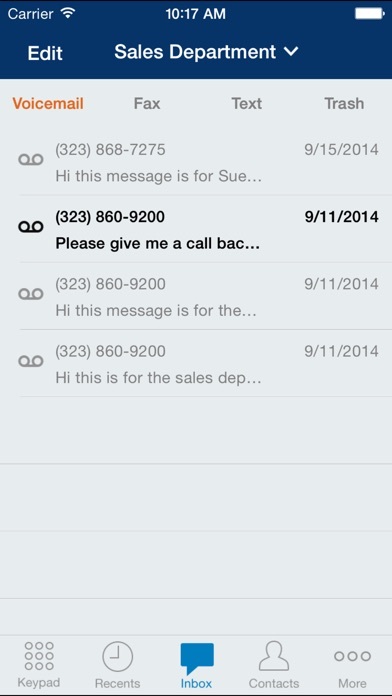 It includes an auto-attendant with easy-to-use menu options for call routing, voicemail, faxing, and conferencing. Onebox is committed to improving our services and we welcome your feedback. 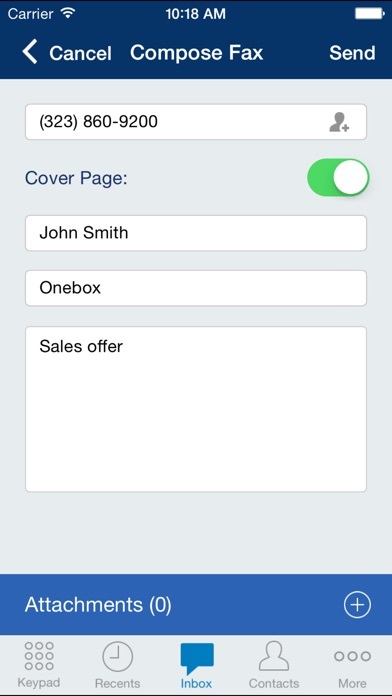 Please send feedback, suggestions, or bug reports to ios@onebox.com. 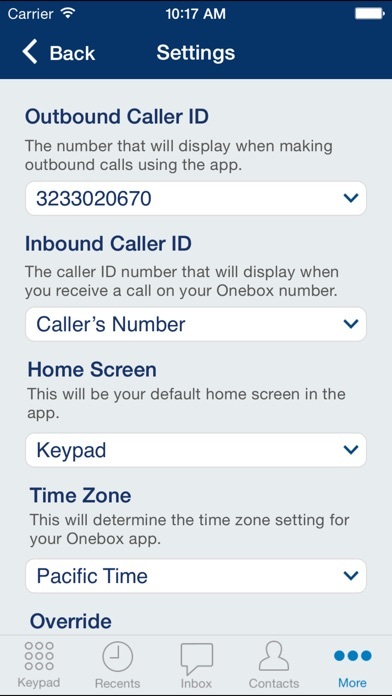 Note: No emergency calling (911) available using the Onebox Application. Valid Onebox account is required to use the mobile app, some features are additional. I rarely write reviews but my experience with this app has been absolutely horrible and tech support hasn’t been able to assist with resolving ANY issues. The app doesn’t ring your phone, doesn’t handle scheduling as it’s setup to do. I’ve paid too much for too long for features I can’t use. Even in my attempts to Port Out my number , their system is either not working or I have to call back so someone can help. I’ve been given conflicting information and I just want to be done with this company and service and keep my number. Can log ONLY in to main account with this app. If you would like to log in to your personal mailbox within the system you CANNOT. There seems to be no way to do this as you can’t log in through user name, phone number only. The Onebox app FINALLY had an update, this week, after two years and even included notification features through your IPhone, (i.e. badge, banners, lock screen), which, is something it never had before (not to be confused with the "forward notifications" option that Onebox already has, which, isn't as organized and practical as these new notification features are). However, after downloading the update, the notifications failed to work. After trying everything possible, to test if they are working, I phoned Onebox customer service. After a half hour phone call, I was able to decipher, from what they told me, that this is not Apple's fault, rather, the Onebox system itself has not caught up with the app yet. There are still a couple of features I'd love the app to have, with notifications being at the top of my list. 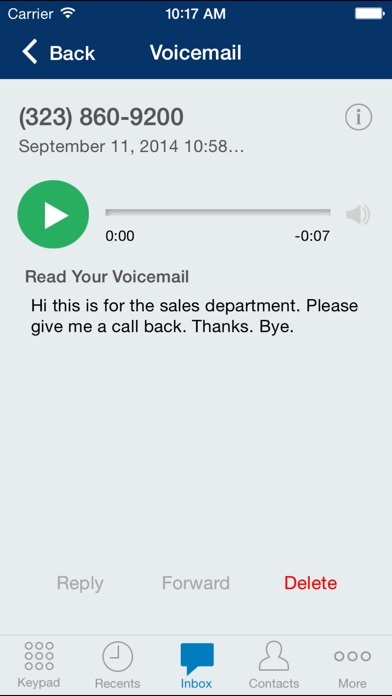 I hope they add these features soon, as this app has great potential to completely satisfy everything you'd need in a phone system. It works but could be so much better. Unless the app is open there is no way to know when new messages (text messages mainly) have arrived. Improve this and it would be a game changer. Going online to the website and trying to write an email is extremely difficult. You cannot copy you cannot paste with emails it won't let you, I feel like I'm trying to send an email from 10 years ago. Stink on ice. Horrible interface. Cheap, ineffective and cumbersome. Wish I could dump the app...and Onebox for that matter. Just sayin'. App has always had little issues. Finally starting working pretty well until the ios10 update. Developers still after almost 6 months haven't updated the app to work with ios10. 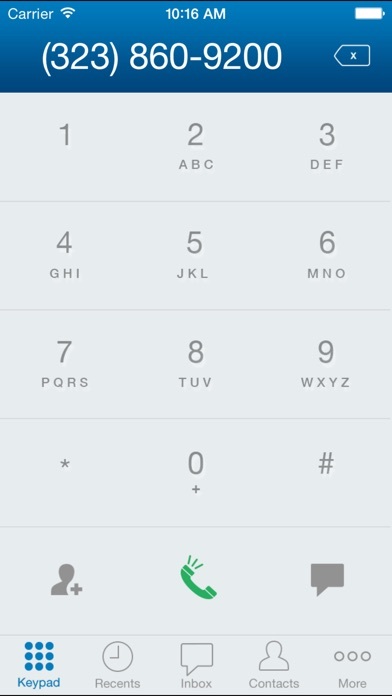 This app still freezes, crashes, and occasionally drops calls.